Why buy before you try when you can try before you buy? If you have any doubt that ¡MAYDAY! 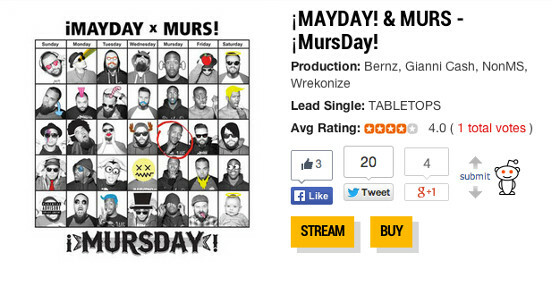 x MURS’s album ¡MURSDAY! will have the summer on smash, you can try it out for yourself on DJBooth.net, who is offering a free stream of the album on their website. Be sure to check out tracks like “Zones”, “Bitcoin Beezy” and “Beast Out The Box” if you don’t believe us! CLICK HERE TO STREAM ¡MAYDAY! x MURS – ¡MURSDAY!